Also, shop our Doggie Endorsements for every member of your fishing pack! The Dart is Sage’s latest venture into the specialty small stream category and a welcomed introduction to the lineup. 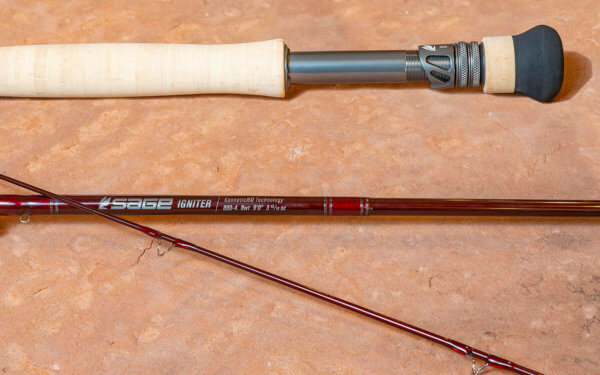 Available in line weights #0-4, all 7’6” inches or less, the Dart Series is more specialized than the Little One, TXLF and other somewhat longer “creek fishing” rods from Sage. Pair your Dart with a Rio Creek line and get ready to drive tacks on the creek, throwing “dart-like” loops. 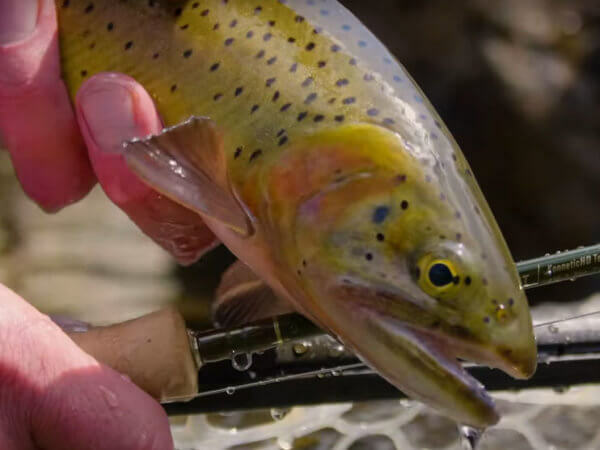 Clearly qualifying as an ultra-fast, expert-oriented fly rod, the Igniter is much friendlier than the Method, easier for mere mortals to cast and fish. Some anglers will fish Igniters as all-around fly rods, but we think of them as rods that solve specific problems: high wind, large flies and distant fish. The 590, 790 and 990 are our favorites, but check out what we had to say about all of these exciting exhilarating new rods in our detailed review below! Scott hit a home run with the new fiberglass F Series and truly created a series of fiberglass rods that has no equal. These rods go about casting and fishing in a way that is just plain fun. Each model is unique and fills a different niche in the creek rod category. From the dry fly purist F 622/4 to the all-arounder F 724/4, there is a glass rod in this lineup you should own. There’s even a 5’ 8” 3-wt 4-piece model for those who seek the ultimate toy. Read what we had to say about the sweet little sticks and check out our on-the-water video. If casting one doesn’t make you smile, consider taking up golf! Rio’s Creek line is the answer for shorter graphite fly rods (graphite rods under 8 feet), earning a spot in our top 10 for being a successful purpose-driven product. Rio created a taper that concentrates the weight of the head toward the front of the fly line and helps the rod load up at short distances. With the right fly rod, like the new Sage Dart, this line absolutely sings and provides for intuitive accuracy. The Rio Creek line is available from WF0F to a WF4F and pairs best with these rods: Sage Dart (all models), Scott Radian 753/4, Sage X 376-4, Sage Pulse 376-4, Scott Flex 753/4. Titan Long (The new standard for a popping bug bass line). Bonefish (Loved the world over by anglers, hated the world over by bonefish). Together, these comprise our all-around favorite fly lines from Scientific Anglers. The Ross crew in Montrose has been killing it! The Ross Evolution LTX is the culmination of their expert machining and dedication to detail. Lightweight with true large arbors and a drag system designed for both fresh and saltwater, these reels look stunning and fish even better. The Evo LTX is available in black or platinum, sizes 3/4, 4/5, 5/6, and 7/8, all under $400. Remember when all saltwater reels were a gold color and most trout reels some shade of black? Sure, it’s been awhile, but today the angler may choose a reel to match almost any rod or any mood. Hatch is in the second year of its limited edition color program and the lineup for 2019 is very cool and classy. The two finishes available for the holidays are Bluewater (in the house) and Oxblood (shipping December 1). Although completely original colors, they are more subdued than last year’s offerings and have a more traditional appearance. Think suit and tie rather than khaki shorts and a Hawaiian shirt. Give us a call for insight on specific rod pairings for balance and cosmetic appeal. If you’re looking for a color from 2018, we have select sizes in some of those finishes as well. Camo hounds, Simms now offers their all-time G3 Guide Wader in a proprietary pattern they call River Camo. These are the exact same G3 Guide Waders you know and love with the updated Gore Tex Pro Shell Wader fabric exclusive to Simms. The camo pattern comes from a collaboration with Veil Camo and is designed to disrupt the human shape from a fish’s perspective. Simms makes an entire collection of apparel and accessories in the new River Camo theme, so you can go head to toe and get your full trout ninja game on. We’ll see you out there, or maybe we won’t? Patagonia’s Black Hole duffel bags have traveled the world over and carried everything under the sun en route. For us fish heads, Patagonia threw a big old Fitz Roy Trout on the side of their 120L Wheeled Duffel and also the popular 60L Duffel. Now you can let your fish flag fly while traveling in style with the best duffel bags in our industry. The 120L Wheeled Duffel costs $349 and the 60L Duffel is $129. While Telluride is not the coldest place to fly fish (we wouldn’t try to rob you of that, Montana), it does sit at 8,750’ in the San Juan Mountains of Southwest Colorado. The Simms Coldweather Shirt is a heavy flannel of 100% brushed polyester for a cotton-like feel without the impossible dry time. It is lined with micro check fleece that is toasty, cozy and ready for a stout beer, a pickup truck and some chainsaw work. Add a Telluride Angler logo cap from Simms, slip into some snow boots and you’ll have the mountain town uniform on lock down. Bandit likes to distinguish himself from the crowd with new and improved fly fishing gear. He is always looking to build his arsenal for weekend getaways with friends and family. Look to Bandit if you need help with gift ideas for your male significant other, brother or son. He is currently trending a Sage Igniter and matching Hatch Finatic Gen 2 reel for his go-to setup. He uses the Fishpond Thunderhead Submersible Lumbar pack with Fishpond accessories because he values a fully waterproof and organized kit for his time on the water. At the end of the day he puts his Simms waders and boots into a Fishpond Cimarron Duffel Bag so wet gear is confined in the rear of his car. He leaves the water with a broad, fishy smile because he had a successful day of fishing with cutting edge, durable, well organized gear. Items featured in this photo: Sage Igniter Fly Rod, Hatch Finatic Gen II, Scientific Anglers Amplitude Trout Fly Line, Fishpond Thunderhead Submersible Lumbar Pack, Simms Headwaters Boa Boot, Fishpond Sweetwater Reel & Gear Case, Fishpond Flattops Wader Duffel, Fishpond Nomad Emerger Net, Fishpond River Rat 2.0, Fishpond Headgate Tippet Holder, Simms Telluride Angler Trucker Cap. Gunni-girl is a beautiful Labrador that is sleek, strong and athletic. She is also very sympathetic to those she knows she can depend on. She expects the same features from her fly fishing gear as she fishes on the Gunnison River. The Scott Ladian with a Ross Evolution LTX will be the perfect match for her. The rod gives her the strength she needs on the water with the sensitivity to really feel the fish. Match a Scientific Angler Amplitude Smooth fly line and she’ll have a finely tuned outfit. She uses gear that is designed specifically for women- such as the Simms Women’s G3 Wader with matching Simms Women’s VaporTread Wading boots. All of her equipment is comfortable and tough, which allows her to break down her rod with a smile on her face. Get the fly fishing woman in your life gear she will appreciate on the water this Christmas! Items featured in this photo: Scott Radian “Ladian” Edition, Ross Reels Evolution LTX, Simms Women’s G3 Guide Stockingfoot Wader, Simms Womens Vaportread Wading Boot, Patagonia Stormfront Sling, Scientific Anglers Amplitude Smooth Trout Taper, Rio Fluoroflex Knotless Leaders, Rio Fluoroflex Plus Tippet, Loon Aquel, MFC Fly Box, Simms Guide Wildbloc Foldover Mitt, Telluride Angler Turquoise Hat. Minnow, aka Minnie, is just making her first casts. Get your kids into the sport of fly fishing without breaking the bank! This Christmas we suggest a rod, reel, line and fishing pack that are ideal for kids right now and for the years to come. The playful green Redington Minnow Outfit and Fishpond Medicine Bow Chest Pack are two items that will definitely hook your kids on fly fishing. Add a colorful fly box, a dozen flies and a youth Patagonia hat and set the hook! Items featured in this photo: Fishpond Medicine Bow Chest Pack, Fishpond Nomad Native Net, Redington Minnow Outfit, Fishpond Thunderhead Submersible Duffle, Telluride Angler Hat, Simms Guide Flannel, Buff USA Headwear. Teeko is the fishing sage all the pups look up to. He taught many of his doggie friends how to fly fish and loves every second he is near the water. If you are looking for gifts for your seasoned fish hound, Teeko has suggestions! Teeko likes the smaller creeks as wading is getting tough for him these days. His go-to rod is the Scott F-Series with a beautiful Abel TR reel. They complement each other and are not too flashy for the old guy. Teeko has a Fishpond Sagebrush Mesh Vest that breathes well and has the perfect pockets for every fishing necessity. A Fishpond Lost Trail Wading Staff certainly seems like a good idea. Add the Fishpond Nomad Native net to his collection and he’ll feel like a new and improved angler! Items featured in this photo: Scott F Series Fly Rod, Abel TR Reel, Fishpond Sagebrush Mesh Vest, Fishpond Thunderhead Submersible Duffle, Fishpond Sweetwater Reel & Gear Case, Fishpond Nomad Emerger Net, Rio Intouch Trout LT, Simms Headwaters Boa Boot, Fishpond Jackalope Rod Tube Case. Your best friend is a passionate angler and you need help choosing the perfect gift? Murphy is here to help! Most weekends Murphy spends time on the water. He has become addicted to his new Sage Dart rod complemented with a Nautilus X reel and Rio Creek fly line. They work magic on the smaller water. A huge asset to his fishing gear are the Fishpond accessories that hold his dry shake, floatant and tippet. He uses them often and loves how handy they are. Murph does his part to be a steward of the land and finds the Fishpond Piopod useful to keep trash tucked away while he is out and adventuring. As Murph heads out to the water he reaches for his lucky Telluride Angler hat, excited for the day ahead! Items featured in this photo: Sage Dart Fly Rod, Nautilus X-Series, RIO Creek Fly Line, Fishpond Arroyo Chestpack, Fishpond Piopod Microtrash Container, Fishpond Dry Shake Bottle Holder, Fishpond Floatant Bottle Holder, Shimizaki Dry Shake, Loon Aquel Floatant, MFC Fly Box, Fishpond Headgate Tippet Holder, Telluride Outside Brick Red Trucker Hat.